Jane Jacobs’ first reference to density called out the mixed-use character of Boston’s North End and its infamous reputation, and yet in many ways it had the power to un-slum itself. The failure of urban reform, urban planning, and architecture of her time, on the other hand, was in how they failed to probe the real world. Jacobs saw self-renewing practices in urban districts with a sense of containment, connections to the city as a whole, and the quality of diversity that served many human purposes. The urban structures of these districts would be full of corners and small useful places. Structures would vary in age and size across these districts with “hard working streets” from “specialty store to animated alley”. With these main elements, dense concentrations of people can form a living city in successful regeneration and constant repair of failure. This was a duality of captured by the title of her first book, “Death and Life of Great American Cities”. Chapter Eleven, entitled “The need for concentrations” closes the argument. Density is a framework that supports high levels of diversity and resists the predisposition toward social regimentation. This was 1961. A half century later it is possible to recognize the complexity involved in promoting new forms of social density in an urban form. Jacobs recognized her city as a place that could provide for everyone. It could do so because it creates opportunities to be creative large or small. Yet, in the nation’s capital in 1963, these words were spoken, “I have a dream that my four little children will one day live in a nation where they will not be judged by the color of their skin but by the content of their character.” Much has changed in reducing sensitivities to the quality of social change driven by urban diversity but much of the Jacobs’ argument for creative urban development tools that support social justice remains a poorly developed part of the city. The medal above is offered by the Rockefeller Foundation. 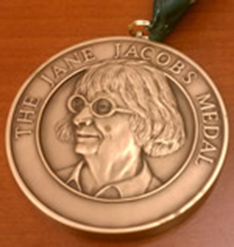 To nominate a New York urban visionary, participants are encouraged to send an email with a description of the nominees’ accomplishments and how they relate to Jane Jacobs’s work and legacy. Nominations are considered on a rolling basis.